The many parasomnias now officially described often occur in young patients. They are at risk of being confused with each other if their characteristic features are not well known and if they are not carefully assessed, mainly clinically. Accurate diagnosis is essential for choice of treatment, which varies considerably for different parasomnias. These points are illustrated mainly by reference to arousal disorders (including sleepwalking and sleep terrors) and the other parasomnias, such as nightmares and sleep-related epilepsies, from which they must be distinguished. Oftentimes it happeneth that the chylde is afraid in ye slepe, & sometymes waketh sodainly, & sterteth, somtyme shriketh and trembleth, whiche effect commeth of the arysing of stynkyng vapours out of ye stomake into the fantasye, and sences of the brayne, as ye maye perceyue by the breath of the chylde: wherefore it is good to geue hym a little hony to swallow, and a lytle pouder of the seedes of peonie, and sometimes triacle, in a litle quantitie with mylke, and to take hede that the chylde sleepe not with a full stomake, but to beare it about waking, tyl part be digested, and whan that it is layde, not to rocke it muche, for ouermuche shaking letteth digestion, and maketh the childe many tymes to vomyte. The above splendid account of nightmares, in the delightful language of the time (for “u” read “v”) and addressed to his “gentyll readers”, including their clinical features, supposed cause and carefully described recommended remedies, is taken from Phaire’s textbook of paediatrics, the first to be published in English.1 The book tells of a range of conditions that he thought were encountered particularly in children. In addition to nightmares, three other sleep problems or disorders, and their equally imaginative treatments, are described, including another parasomnia “pyssing in bedde”. Undoubtedly, things have moved on since Phaire’s day. Much has been established about children’s sleep disorders in general, but knowledge remains thinly spread among healthcare professionals and others involved with the welfare of children.2 The parasomnias illustrate well the confusions and inadequacies that can exist in the field of children’s sleep disorders. Put simply, they are repetitive unusual behaviours or strange experiences that occur in relation to sleep. In all, about 30 different parasomnias are now described in the 2005 revision of the International classification of sleep disorders (ICSD-2).3 They vary considerably in the changes that take place during them. Some involve very complicated and at times dramatic behaviour; others (such as the “sleep related movement disorders”) are relatively elementary in nature. Adult diagnostic criteria cannot always be automatically applied to parasomnias, as there can be differences between adults and children in the clinical manifestations of basically the same parasomnia. For example, waking at the end of a sleepwalking or sleep terror episode seems to rarely occur in young children, but may happen later in development. Also, it is inevitable that special difficulty will be experienced in identifying parasomnias that consist essentially of subjective feelings because of the young child’s limited ability to describe such experiences. In general, the prospects of spontaneous remission are better in childhood parasomnias, which can often be viewed as temporary, benign, “developmental” phenomena.4 Reassurance on this point can be very comforting to all concerned. Similarly, many primary parasomnias (see below) starting in childhood, despite their possibly dramatic nature, are rarely associated with a medical or psychiatric condition. This is generally less so in adult parasomnias. Confusion between the different childhood parasomnias is not uncommon. For example, as judged by some textbook accounts, sleep terrors and nightmares (two very different types of parasomnia) may be mistaken for each other. Indeed, sometimes there is a tendency to call any dramatic parasomnia a “nightmare”. Correct diagnosis is important because different parasomnias each have their own significance and call for contrasting types of advice and treatment. Accurate diagnosis is often possible by means of as detailed an account as possible of the subjective and objective sequence of events from the onset of the episode to its resolution, and of the circumstances in which the episode occurred including its duration and timing. Audiovisual recording (including home recording by parents, if feasible) can be very informative and often adds details that are missed in descriptions given by parents in the clinic. Fortunately, in view of its limited availability, polysomnography is required in only a minority of cases where clinical evaluation is inconclusive or, sometimes, where the child might have more than one type of sleep disorder. The possibility of comorbidity should be remembered not only between different sleep disorders but also between a sleep disorder and some different type of condition. Parasomnias can lead to psychological complications if a child is frightened, embarrassed or otherwise upset by his parasomnia experience, or by the reactions of other people to the episodes. The minority of primary parasomnias that are symptomatic of a psychological problem might be characterised by frequent occurrence, late onset or persistence, or the fact that they followed a traumatic experience. Specific treatment, including medication, is needed in relatively few cases of primary parasomnia, but is likely to be required for the underlying cause of many of the secondary parasomnias, as discussed below. There are two distinct types of sleep: non-rapid eye movement (NREM) sleep and rapid eye movement (REM) sleep. NREM sleep consists of four levels of increasing depth of sleep. At the lower levels, brain activity contains mainly slow waves. For this reason, these levels are called slow wave sleep. They constitute deep sleep from which it is difficult to wake. Arousal disorders arise from this type of sleep. Eye movements are absent, but skeletal muscle activity is largely retained. Cardiac and respiratory rates are regular. REM sleep is very different. It is a highly active brain state in which, for example, cerebral blood flow is increased and the EEG is similar to that seen in the awake, alert state. High-amplitude eye deflections give this type of sleep its name. Normally, despite the active brain state, skeletal musculature in REM sleep is effectively paralysed. Cardiac and respiratory rates are irregular. Most dreaming occurs in REM sleep, with which therefore nightmares and REM sleep behaviour disorder are linked. 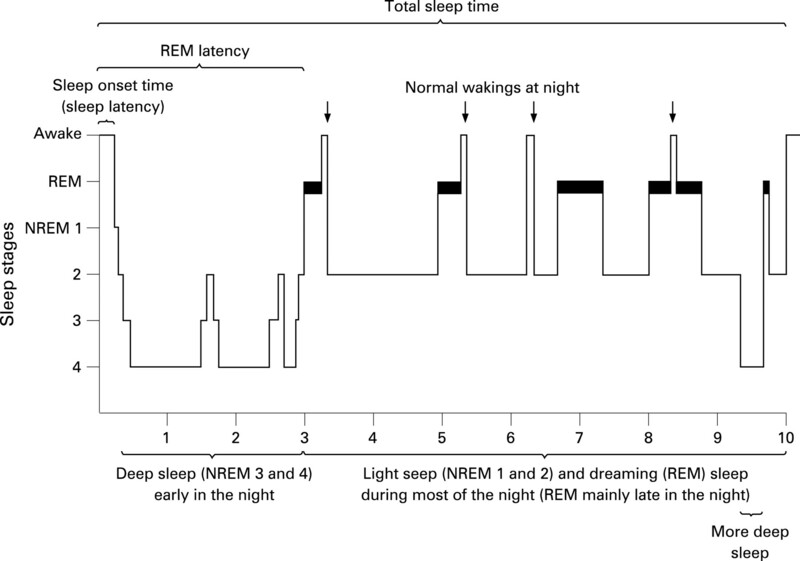 Figure 1 shows how NREM and REM sleep periods alternate several times throughout the night. Deep NREM sleep is seen mainly in the first third of the night, when therefore deep NREM-related parasomnias (the arousal disorders) typically occur. Conversely, REM sleep is most abundant in the last third of overnight sleep, when dreaming mainly occurs. These differences therefore can give the timing of parasomnias some diagnostic significance, as discussed below. Figure 1 Characteristic progression of sleep stages overnight (“hypnogram”) in a healthy school-age child. NREM, non-rapid eye movement; REM, rapid eye movement. ICSD-2 describes about 30 types of parasomnia, including eight sleep-related movement disorders plus a few other symptoms and sleep-related events of a parasomnia-like nature. To keep within the required limits of this review, the following account is necessarily selective. A more comprehensive account of childhood and adolescent parasomnias is available elsewhere.6 The three types of parasomnia described were chosen mainly because of their often dramatic features, which are likely to cause concern to parents in particular, and also because of their tendency to be confused with each other. However, mention is also made of other parasomnias, including those that enter into the differential diagnosis of the three types of parasomnia chosen. Parasomnias can be divided into those that constitute primary sleep phenomena (“primary parasomnias”) and others that are manifestations of underlying medical or psychiatric disorder (“secondary parasomnias”). Box 1 lists the main primary parasomnias according to the phase and/or type of sleep in which they usually occur and, by the same token, the part that the timing of parasomnias can play in helping to identify their nature. Box 2 indicates the main secondary parasomnias. From these lists, arousal disorders, nightmares and nocturnal epilepsies have been selected for special attention in this article, partly because these concepts are somewhat clinically complicated and also because they can be confused with each other. However, two points should be made about some of the other parasomnias not chosen for special mention. “Exploding head syndrome”,9 in which sudden fleeting dramatic sensations are experienced (eg, loud bang or flash of light) when drowsy. These are the equivalent to isolated bodily jerks experienced by many people in the same circumstances. All these parasomnias appear to be common, although their exact prevalence in young patients is unknown. (b) Until comparatively recently, some of the parasomnias listed in boxes 1 and 2 were thought to occur only in adults, but now they are known to exist at an earlier age. Sleep-related eating disorder,17 ie, excessive consumption of food at night which is often associated with sleepwalking, is yet another example of a parasomnia occurring at various ages including in the young. Arousal disorders18 (confusional arousals, sleepwalking and sleep terrors) are very common in childhood. In a minority they persist into adult life and in a few they begin in adolescence. The arousal is, in fact, a partial arousal usually from deep NREM sleep to a lighter stage of sleep, usually early in the night. In this state, the child displays a curious combination of features suggestive of being simultaneously awake and asleep and often appears confused and disoriented and relatively unresponsive to environmental events including parents’ attempts to communicate. There is little or (usually) no recall of events during each episode of disturbed behaviour, at the end of which waking sometimes occurs, particularly in later childhood or adolescence. In such arousals, various behaviours can occur from simple to complicated, such as rushing out of the house in a highly agitated state. Other behaviours occasionally described in young people include aggressive acts and sleep-related eating disorders. Usually only one episode occurs during the night. A first-degree family history of partial arousals has been reported in the majority of cases. Precipitating factors include fever, systemic illness, central nervous system-depressant medication or other substances, internal or external sleep-interrupting stimuli (such as a full bladder, sleeping in an unfamiliar environment, or the child being woken forcefully) and other sleep disorders in which sleep is interrupted, such as sleep-related breathing disorders. Psychological factors may also precipitate or maintain the occurrence of the episodes and also influence their severity. The more dramatic forms of arousal disorder, in particular, may well be interpreted by parents as a sign of psychiatric disorder, which is rarely correct. However, arousal disorders can be socially embarrassing, especially when they occur away from home. A child might display a sequence of confusional arousals in early childhood, sleepwalking later, followed by sleep terrors in later childhood and adolescence. Alternatively, elements of all three forms can occur at any one stage of development. Similarly, the family history of arousal disorder can take a variety of forms. Confusional arousals occur mainly in infants and toddlers. An episode may begin with movements and moaning and then progress to agitated and confused behaviour with crying (perhaps intense), calling out, or thrashing about. Parents are often very alarmed and, wanting to console the child but being unable to get through to them, they may make vigorous attempts to waken them, without success or only with much trying. Each episode usually lasts 5–15 minutes (possibly much longer) before the child calms down spontaneously and returns to restful sleep. Sleepwalking (somnambulism) is said to occur occasionally in 20–40% of children and frequently in another 3–4%, mainly between 4 and 8 years of age. Episodes, which usually last up to 10 minutes or so, are usually less dramatic than the other arousal disorders. The child may calmly walk around his or her room, to the toilet or to his or her parents’ bedroom. The child may appear downstairs, looking vague, with eyes open but with a glassy stare. At most, he or she will be partially responsive. Some children are found asleep in various parts of the house. Other complex habitual behaviour (“automatism”) may occur, possibly lasting many minutes or longer. Movements are often clumsy, and urinating in places other than the toilet, or other inappropriate behaviour, is common. Accidental injury in sleepwalking (eg, from falling downstairs) is a serious risk. In later childhood or adolescence, the wandering may extend further within the house or outside. At this age and later, the sleepwalking may take an agitated form, similar to sleep terrors, with an even greater risk of injury from crashing through windows or glass doors, for example. Rarely, the child’s behaviour results in injury to someone else. Sleep terrors (night terrors) occur in about 3% of children, mainly in later childhood. Classically, parents are woken by their child’s piercing scream, which marks the very sudden onset of the partial arousal. The child appears terrified, with staring eyes, intense sweating, rapid pulse and cries or other vocalisations suggesting intense distress. He or she may jump out of bed and rush about frantically, as if trying to escape from something. Injury from running into furniture or jumping through windows is again a serious risk. Other people may also be injured in the process. The episode usually lasts no more than a few minutes, typically ends abruptly, and the child then settles back to quiet sleep. If he or she wakes up at the end of the episode, the child may describe feelings of primitive threat or danger, but not the extended narrative of a nightmare. Parasomnia overlap disorder19 refers to a combination of arousal disorder and REM sleep behaviour disorder (see below) which has been reported in some young patients. If a detailed description can be obtained, special investigations are not usually necessary for the recognition of arousal disorders. However, polysomnography, together with audiovisual monitoring, during the episodes might well be helpful if, despite careful clinical evaluation, the diagnosis is unclear. There are a number of important principles regarding the management of childhood arousal disorders. Parents’ anxiety is usually lessened by explanation with reassurance (where justified) that these often dramatic and frightening events do not mean that the child is ill or disordered, and that he or she can usually be expected to grow out of them by later childhood or adolescence. Regular and adequate sleep routines to prevent loss or disruption of sleep resulting in an increased amount of deep NREM sleep are important, as well as avoidance of other known precipitating factors. The environment should be as safe as possible to reduce the risk of injury (eg, removal of obstructions in the bedroom, secure windows, install locks or alarms on outside doors, or cover windows with heavy curtains). Parents should not try to waken or restrain their child during the episode. Waking the child is difficult, counterproductive (the child will be confused and frightened if awakened forcefully) and unnecessary. It is much better to wait until the episode subsides and calmly help the child back to sleep. If, as is usually the case, the child has no recall of the episodes, there is little point in telling the child about them, as this may cause unnecessary anxiety. If sleepwalking or sleep terror episodes are frequent and consistent in their timing, “scheduled awakening”20 can be helpful. The child is gently and briefly woken 15–30 minutes before the episode is due. The procedure is repeated nightly for up to a month. Preliminary reports suggest that improvement can be maintained for at least several months. However, it has been suggested that sometimes this form of treatment causes such loss of sleep that the arousal disorder becomes more severe. Medication should be reserved for particularly worrying, embarrassing or dangerous arousals where other measures have failed. Benzodiazepines (such as low-dose clonazepam) and tricyclic drugs (eg, imipramine) have been used, but with mixed results. There is some evidence that selective serotonin reuptake inhibitors can be effective. Use of benzodiazepines is best restricted to several weeks at most to avoid possible hazards of long-term use. If there is evidence of an underlying psychological problem, appropriate enquiries and help are indicated. Arousal disorders must be distinguished from a number of other parasomnias of a complex and dramatic nature because of wide differences in origin, significance, treatment requirements and prognosis. Perhaps the parasomnias that can particularly give rise to uncertainty in this respect are nightmares and nocturnal epileptic seizures, both of which will be described below. In addition, the choice of these particular parasomnias to emphasise seems appropriate because, as yet, less is known about the sleep-related epilepsies than is ideally required to help childhood parasomnias to be correctly identified. Table 1 shows the main distinguishing features between arousal disorder episodes, nightmares and nocturnal seizures. However, the varied clinical manifestations of nocturnal seizures make it difficult to generalise precisely about the features that distinguish such seizures from these other parasomnias. This term can be a source of confusion and diagnostic inaccuracy when it is used for any sort of dramatic nocturnal episode in which the child appears to be very frightened. True nightmares are frightening dreams that cause awakening in a highly distressed state.25 They usually happen in the later part of overnight sleep when most REM (or dreaming) sleep occurs and are said to be experienced by up to 75% of children from early childhood onwards—persistently in as many as 30–40%. The content of children’s nightmares varies with age, tending to become increasingly complex, ie, monsters or other frightening creatures at an early age, progressing to dreams based on frightening TV or film content or upsetting experiences at home or at school. Typically, the child wakes up, very frightened and fully alert, and describes having just had an alarming, vividly recalled sequence of dream events (ie, a narrative), often involving the child. He or she remains afraid after waking up and cannot get back to sleep for some time, although it is usually possible to reassure and comfort them. Generally, such dreams occur infrequently without any serious psychological significance. They may be spontaneous or precipitated by illness or psychological stress of any sort. Various drugs, mainly used in adults (eg, some antidepressants), have been associated with nightmares. Especially frequent nightmares may well be a prominent feature of an anxiety disorder including post-traumatic stress disorder,26 and their content, especially if consistent, may be revealing about the nature of the traumatic experience (eg, child abuse). In such circumstances, nightmares may well coexist with bedtime fears. Occasional nightmares require no special measures apart from comforting the child at the time they occur. Preventive measures include avoidance of precipitating factors such as those mentioned above. Other measures (of a behavioural nature) for use in severe cases include systematically helping the child to be less concerned about the frightening content of the nightmare, or rehearsing the content but with a modified, less alarming ending. In even more complicated cases, treatment is that of the underlying cause, including the use of various forms of psychiatric treatment. In various ways, sleep disorders, especially the parasomnias, can be confused with epilepsy and vice versa. These are important mistakes because the significance of epilepsy is very different from other parasomnias. Few generalisations about “epilepsy” are justified because the term covers such a wide range of conditions which are different in their cause, manifestations, effects, treatment needs and natural history. This diversity is reflected in those epilepsies in which seizures occur at night. The following types of epilepsy are, to varying degrees, related to sleep. The first four types are classified as “benign” in the sense that, despite their focal origin in the brain, they are not typically the result of a structural abnormality and can be expected to remit spontaneously in time.27 All five types can readily be confused with non-epileptic parasomnias, as their clinical features can be complex and dramatic. Benign partial epilepsy with centrotemporal spikes (Rolandic epilepsy), which is a common form of childhood epilepsy in which about 75% of patients have their seizures exclusively during sleep. The seizures involve distressing oropharyngeal–facial movements and sensations corresponding to the anatomical origin of the seizures. Benign epilepsy with affective symptoms in which apparent terror and screaming occur. Panayiotopoulos syndrome, in which seizures, often involving vomiting with other autonomic symptoms, are prominent features. NFLE deserves special mention not only because of its very close association with sleep, but because its clinical manifestations make it particularly prone to misinterpretation as non-epileptic phenomena. Although mainly described in adults, it also occurs in children.29 It is now known that NFLE can take a variety of forms but the usual variety is often misdiagnosed, mainly because of the complicated motor manifestations (eg, kicking, hitting, rocking, thrashing and cycling or scissor movements of the legs) and vocalisations (from grunting, coughing, muttering or moaning to shouting, screaming or roaring) that characterise many attacks. As such, they are very different from other seizure types. The abrupt onset and termination, short duration of the attacks (different from seizures of temporal lobe origin) and, sometimes, preservation of consciousness can also suggest a non-epileptic basis for the attacks. The underlying cerebral pathology in NFLE varies and no structural abnormality may be found. One form is clearly genetic in origin with an autosomal dominant pattern. In the first instance, diagnosis rests on awareness of this form of epilepsy and recognition of its clinical features. EEG recordings, even during the episodes, are of limited diagnostic value. Response to treatment seems very variable. Again, it is difficult to generalise across the range of epilepsy syndromes. Explanation of the nature of the condition based on accurate diagnosis is, of course, required. Benign epilepsies may need no more than reassurance for all concerned that there is no serious underlying cause and that they can usually be expected to run their course without pharmacological intervention, although this can be advisable if the seizures are unusually frequent or particularly distressing. If there is evidence of structural pathology, the usual medical and possibly surgical treatment approaches to epilepsies with this type of cause will need to be mobilised, together with other forms of comprehensive care. Even from this brief, selective account, it can be seen that, compared with Thomas Phaire’s account over 460 years ago, a rich and extensive variety of episodic disturbances associated with sleep is now recognised, each having its own type of significance. That being so, accurate diagnosis, avoiding confusion between the different parasomnias, is essential. This is mainly achieved by careful, detailed clinical assessment, although sleep recordings, possibly extended to include additional EEG channels if epilepsy is suspected, will sometimes be needed. Appropriate advice and treatment, which depends essentially on correct diagnosis, can be expected to be successful in many cases.
. The boke of chyldren (1545). Translated by Neale AV, Wallis HRE. Edinburgh: Livingstone, 1955.
. A clinical guide to sleep disorders in children and adolescents. Cambridge: Cambridge University Press, 2001. American Academy of Sleep Medicine. International classification of sleep disorders, 2nd edition: Diagnostic and coding manual. Westchester, IL: American Academy of Sleep Medicine, 2005.
. Development of parasomnias from childhood to early adolescence. Pediatrics 2000;106:67–74.
. Clinical diagnosis and misdiagnosis of sleep disorders. J Neurol Neurosurg Psychiatry 2007;78:1293–7.
. Parasomnias of childhood and adolescence. Sleep in children and adolescents. Sleep Med Clin 2007;2:405–17.
. Sleep paralysis and hallucinosis. Behav Neurol 1998;11:109–12.
. Rhythmic movement disorder in children. CNS Spectr 2003;8:135–8.
. The exploding head syndrome. Curr Pain Headache Rep 2001;5:279–80.
. Periodic limb movements in sleep and periodic limb movement disorder. Neurol Sci 2007;28(Suppl 1):59–64.
. Associations between symptoms of inattention, hyperactivity, restless legs and periodic limb movements. Sleep 2002;25:213–18.
. Periodic limb movement in sleep in children with Williams syndrome. J Pediatr 1998;133:670–4.
. Sleep breathing and periodic leg movement pattern in Angelman syndrome: a polygraphic study. Clin Neurophysiol 2005;116:2685–92.
. Some children with growing pains may actually have restless legs syndrome. Sleep 2004;27:767–73.
. REM sleep behavior disorder: clinical, developmental, and neuroscienceperspectives 16 years after its formal identification in sleep. Sleep 2002;25:120–38.
. Rapid eye movement sleep behaviour disorder in children and adolescents. Dev Med Child Neurol 2008;50:728–32.
. Sleep-related eating disorder and night eating syndrome: sleep disorders, eating disorders, or both. Sleep 2006;29:876–7.
. Disorders of arousal. In: Thorpy MJ, ed. Handbook of sleep disorders. New York: Marcel Dekker, 1990:531–49.
. A parasomnia overlap disorder involving sleepwalking, sleep terrors, and REM sleep behavior disorder in 33 polysomnographically confirmed cases. Sleep 1997;20:972–81.
. The use of scheduled awakenings to eliminate childhood sleepwalking. J Pediat Psychol 1997;22:345–53.
. Obstructive sleep apnea syndrome in infants and children: clinical features and pathophysiology. In: Ferber R, Kryger M, eds. Principles and practice of sleep medicine in the child. Philadelphia: Saunders, 1995:163–91.
. Sleep and respiratory disease in children. In: Ferber R, Kryger M, eds. Principles and practice of sleep medicine in the child. Philadelphia: Saunders, 1995:217–30.
. The relationship of sleep disturbance to childhood panic disorder. In: Shaefer CE, ed. Clinical handbook of sleep disorders in children. Northvale, NJ: Jason Aronson, 1995:285–310.
. Psychogenic events presenting as parasomnia. Sleep 20:402–5.
. Assessment ant treatment of children’s nightmares: a review. Psychology: a Journal of Human Behavior 1998;35:30–6.
. Posttraumatic stress disorder in children and adolescents: a review and analysis. Clin Child Fam Psychol Rev 2000;3:135–54.
. Benign childhood focal seizures and related syndromes. In: Panayiotopoulos CP, ed. A clinical guide to epileptic syndromes and their treatment. Chipping Norton: Bladon Medical Publishing, 2002:89–113.
. The wide clinical spectrum of nocturnal frontal lobe epilepsy. Sleep Med Rev 2000;4:375–86.
. Frontal lobe complex partial seizures in children: a form of epilepsy at particular risk of misdiagnosis. Dev Med Child Neurol 1991;3:998–1009.
. Movement disorders in sleep: guidelines for differentiating epileptic from non-epileptic motor phenomena arising from sleep. Sleep Med Rev 2007;11:255–67.